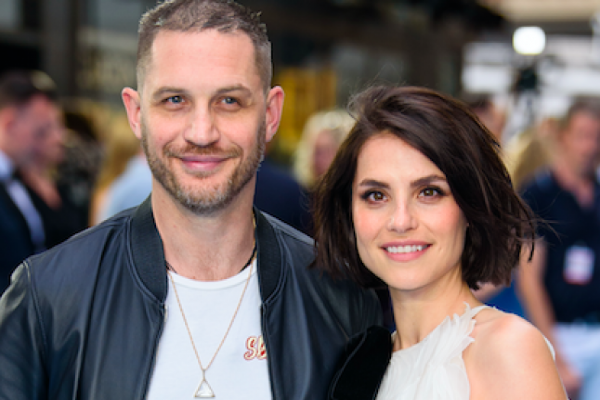 HomeTagsPosts tagged with "tom hardy"
Huge congratulations are in order for actor Tom Hardy and his wife Charlotte Riley. The acting duo have welcomed their second child together. It has been confirmed by The Sun that the couple, who met on the set of Wuthering Heights, welcomed a baby boy last month. Both Tom and Charlotte are exceptionally private about their personal lives and have only told close friends and their families about their new bundle of joy. A friend told The Sun that they are overjoyed to welcome another child into their family. “They’ve been laying low over the festive period so they can get used to having a busier household and adjusting to the needs of a newborn,” they explained. The doting parents decided to call their baby boy after quite the famous movie character, who happens to be one of Tom’s all time favourites. The source revealed they called their son Forrest after Forrest Gump. “They love the name Forrest as it’s earthy and strong. 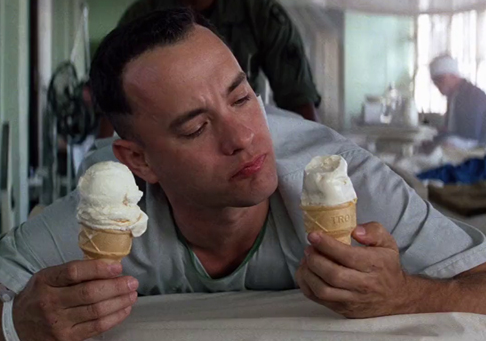 Tom has always found the movie Forrest Gump very inspiring and enjoyable and thinks it fits,” they shared. Tom and Charlotte are also parents to a three-year-old daughter, but they have never revealed her name to the public. The Peaky Blinders star also shares ten-year-old son Louis with his former partner and fellow actor Rachael Speed. 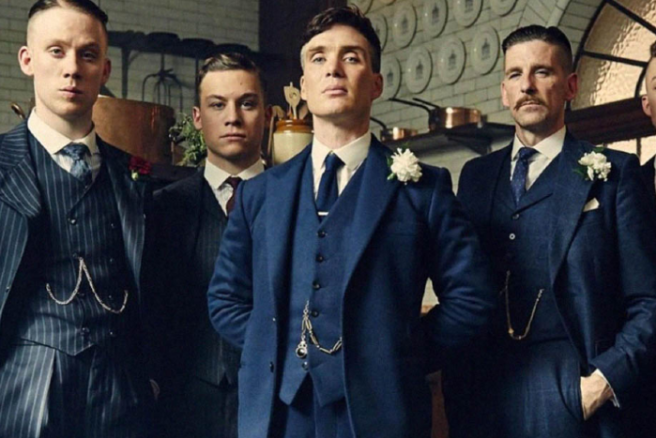 Fans of the hit BBC show Peaky Blinders are currently being driven mad waiting for the latest series, and the official Instagram page for the TV series has shared an image which hints at bloodshed for the gang. The snap gives a major hint for the notorious Birmingham gang, who live in a morally grey world of assassination, gang warfare and family crimes. The show is known for not holding back when it comes to killing off our favourite characters, and the caption of the post has fans worried that yet another death is coming for the Shelby clan. The caption reads; "First day back on set for #PeakyBlinders Series 5. You're sure of a big surprise." The image shows a blood-spattered clapper-board above a gun in a woodland setting, and boy are we concerned. Season four finished off with the Changretta threat being sufficiently dealt with, but creator Steven Knight most definitely has more enemies in store for Tommy Shelby to handle. We simply can't wait for Peaky Blinders to return, but can we handle the drama? Every character has blood on their hands, we have no idea who the 'good guys' are, because human nature isn't black and white. The Shelbys float between light and dark, and their friends and foes switch sides constantly. Though Tommy Shelby is an honourable man when it comes to his family, who knows what he's capable of in terms of violence against those who cross him. After the latest Instagram post, fans are now foreseeing a major death in the series. What do you think their hint means? 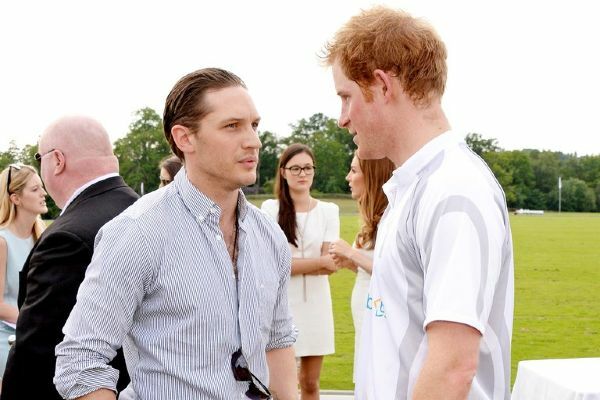 Heartthrob Tom Hardy recently spilled about him and Prince Harry's total bromance, and it is actually adorable. Tom and Harry have been seen in public before on several occasions and have also been known to do some charity work together. The English actor has been an acting ambassador for The Prince’s Trust, which helps disadvantaged people aged 14 to 30 overcome obstacles and transition into work, education, or training. His passion may be based on his own troublesome past, as Tom is no stranger to surviving life’s darkest depths as a youth. He told The Daily Mail that he used to struggle with drug addiction himself and has now been sober for over a decade. 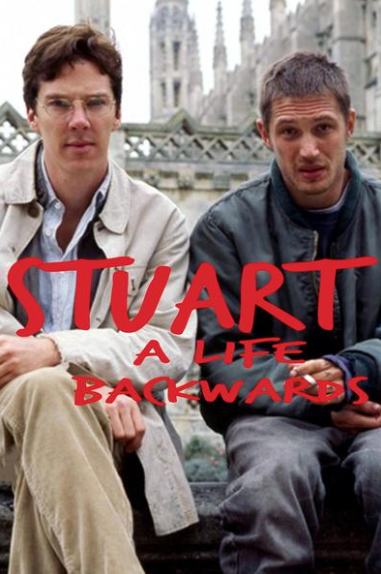 “The only thing that saved me through that dark time was acting,” he divulged. Everyone needs a purpose or a passion to push them through the ups and downs that this world throws their way. Tom and Harry understand that without this focus, it can be easy to lose sight of our goals and let the hard parts of life drown out our potential. Despite the obstacles thrown his way, Tom has survived into fame and success through his love of acting. “I found that I was good at it, I wanted to make the effort to invest time and effort into doing it. It is this same driven outlook that he hopes to share with troubled youth in the Prince’s charity. Perhaps it is this shared interest for disadvantaged youths that Prince Harry and Tom share. In May, Tom made sure to attend the Duke and Duchess of Sussex's royal wedding with his wife Charlotte Riley. At the time, the actor had been filming Fonzo, in which he plays the iconic role of Al Capone. And after six weeks of 19 hour days, he flew home the morning of the Prince’s wedding day. Just last year, Tom co-sponsored a campaign with The Prince’s Trust called "Youth Can Do It," which helps build young people's self-esteem. The pair has also been spotted attending the Audi Polo Challenge cup in London in 2016 and filming a cameo for Star Wars: The Last Jedi film. The scene was later cut because Harry and his brother, Prince William, were too tall in comparison with the other stormtroopers. It seems the pair has a bit of bromance brewing, whether this is based on the same charitable passions or a shared Star Wars fandom is hard to tell. I guess we will just have to wait and see what the compassionate, bromantic duo do next. It is amazing to think that even in Hollywood, there are doppelgängers. 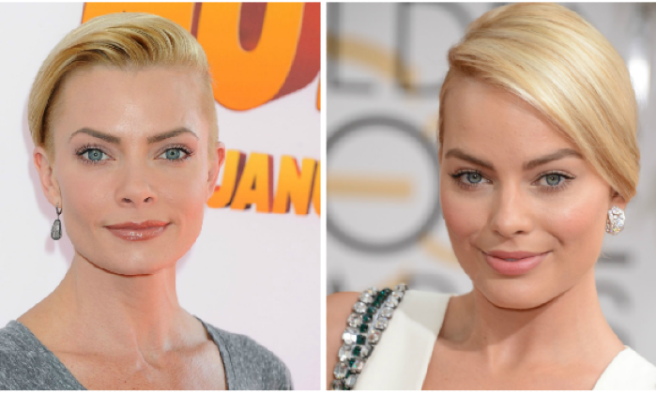 We did some research into some of the most striking celebrity resemblances in Hollywood, and the results were CRAZY. Anyone else totally freaked out? These two actors were definitely separated at birth. Maybe it's because they're both so HOT? These two have been mistaken for each other a number of times, and always play along! This one is just freaky! 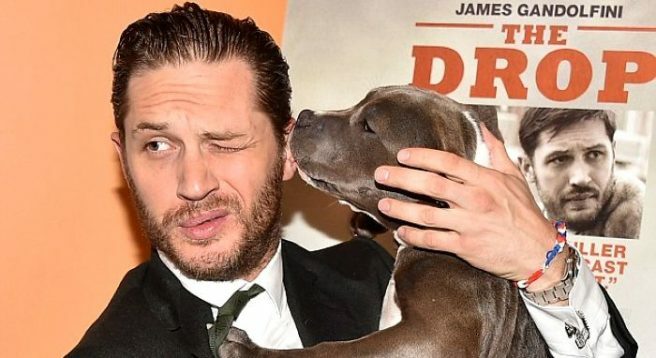 Tom Hardy has penned an emotional tribute to his dog Woody, who sadly passed away earlier this week. In a heartfelt blog post, the actor told fans about his loss, explaining that Woody had died following a six-month battled with polymyositisis – a rare, autoimmune, muscle disease. 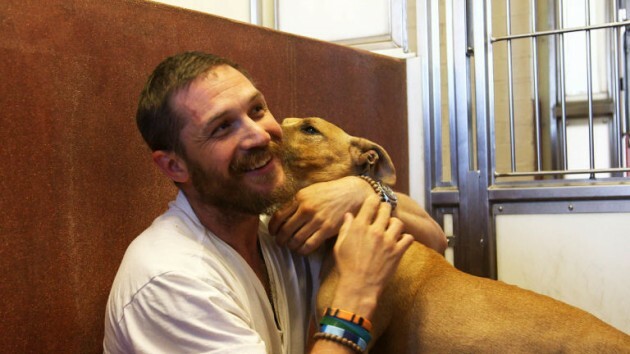 Tom had rescued the dog back in 2012 when he was filming his film Lawless in Atlanta, and the two have been “best friends” ever since. 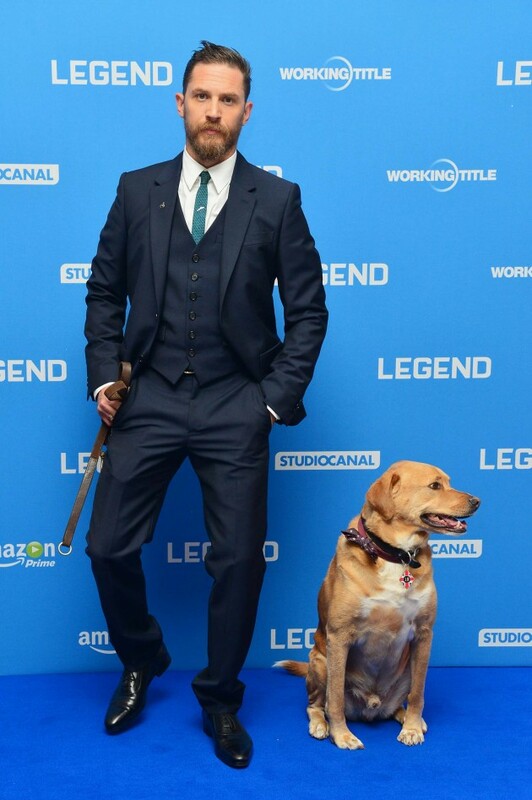 In the post, Tom told the story of the night he and Woody first met, explaining how the Labrador-cross ran out in front of his car one night while he was driving in Georgia with his Lawless co-star, Jessica Chastain. He then got out of his car and went out looking for the dog, who was just 11-weeks-old at the time. 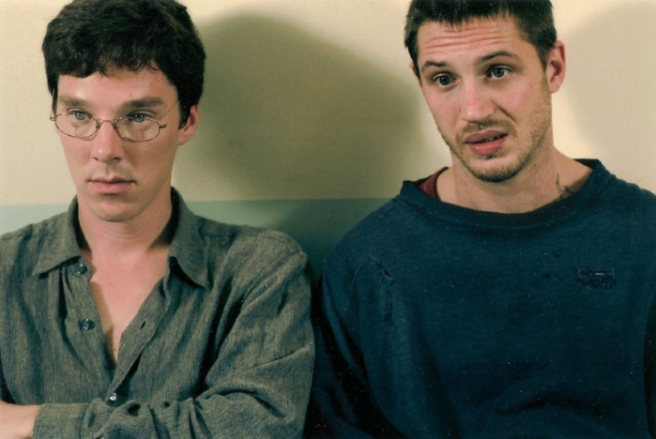 When it came time for Tom to return to London, Jessica's parents stepped in and took care of Woody at their California home until the actor could return to the US. 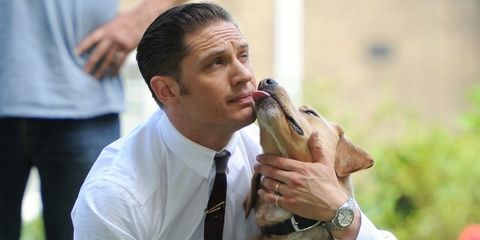 Tom's wife, Charlotte Riley, also had a close bond with the rescue dog. Woody was quite the regular on Hollywood movie sets, and red carpet premieres, and was even named TIME magazine's 73rd most influential animal . “He beat JAWS. Something we all thought was brilliant. He's been in peaky blinders. Legend everyone who met him loved him. He didn't have a bad bone in his body. All he knew was love,” Tom wrote. We're a bit sceptical of the latest celeb news because… really? Duck? 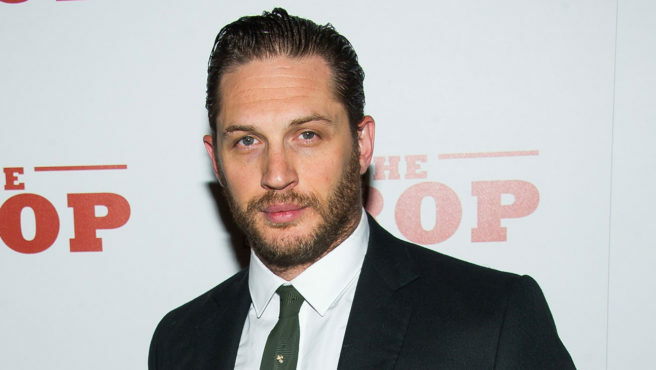 Don't get us wrong, we love a good Chinese duck dinner, but apparently Guy Ritchie and Tom Hardy "stormed out of a Chinese restaurant after they were denied a peking duck dish." The Hollywood stars arrived at Min Jiang in London, where they ordered the sought-after duck. However, what they didn't know was that the speciality dish has to be ordered 24 hours in advance, and even still, it would take 45 minutes each to cook. According to The Sun, Guy wasn't very happy about this and started giving out to the waiter. A source from inside the restaurant said that Guy shouted angrily, "You've just lost yourself two customers." The insider continued: "Guy was not happy. He kept saying he didn't want anything else – he had only come for the duck. "He said that was the dish everyone talks about. The waiter was very apologetic, but there was nothing he could do. They didn't have the duck. "As things got more heated, Tom was trying to pull his friend away, saying 'Come on mate'. And eventually he realised he was getting no where." 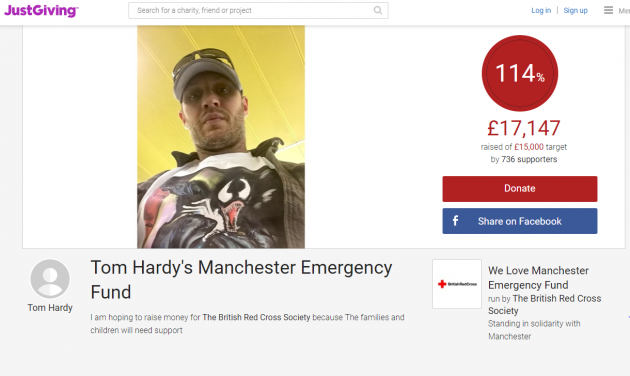 Tom Hardy has started a fundraising page to raise money for victims of Monday night's terror attack in Manchester. The actor described the events as an “inconceivable atrocity” and has now set up a Just Giving page in order to gather donations for the British Red Cross Society's 'We Love Manchester Emergency Fund'. The star set out to raise £15,000, but that total has since been surpassed with £17,147 raised so far. 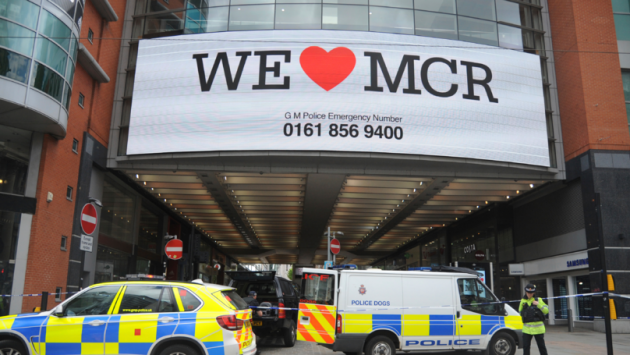 Meanwhile, organisations, individuals and community groups have donated over £2 million in just 24 hours to the Manchester Evening News' fundraising campaign. 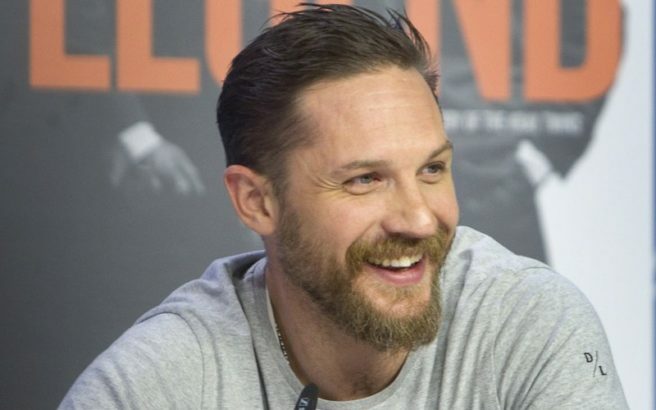 Tom Hardy has starred in some of the most successful action movies of the past decade, but on Sunday, the Max Mad actor brought some of his on-screen skills to the streets of London. Two men had broken a red light before crashing the stolen moped they were riding into a £50,000 Mercedes at a busy junction. Reports claim the actor was spotted chasing one of the thieves through gardens and building sites in London before making a citizen’s arrest on Sunday. Tom then searched the man for weapons and waited with him until police officers came and made an official arrest. An eyewitness told The Sun: "Tom must have been walking down the road. He went off like a shot in pursuit and looked furious." He added, "I asked Tom what happened and he told me he chased him through my back garden and caught him around the block – but the route was like an assault course." "I think he even checked the kid’s ID before cops took over." Both men involved in the incident are reportedly facing charges. 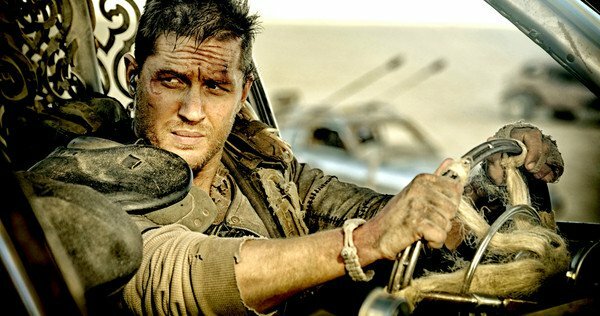 According to the paper, Tom Hardy’s spokeswoman declined to comment. We all love Tom Hardy here in Shemazing! HQ, and something we love even more is the numerous photos and gifs on him holding dogs. TOO CUTE. However, Tom was at a fundraiser during the week for Battersea Dogs and Cats Home and the pups he chose to take a photo with seemed less than impressed with the heart throb. Of course, Tom is showing off his beautiful smile, but the dogs are all like, "Eh, can you not?" The ginger one is especially like, "just leave me alone, Tom." Even though they don't seem bothered, they are incredibly cute pups, and it's all going to a good cause so we can't complain that much. 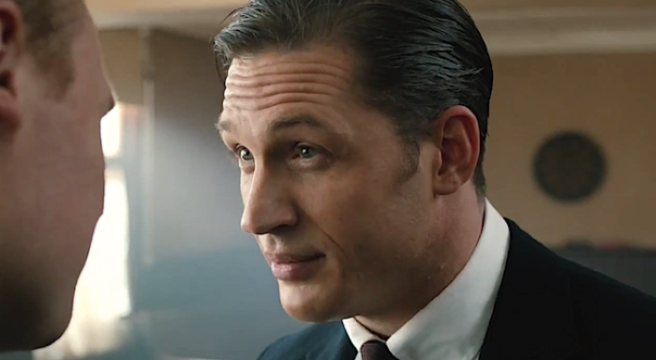 Saying that though, if we were in Tom Hardy's arms, we'd probably swoon so much we'd lose consciousness. Well, he's certainly not shy. We know Tom Hardy isn't afraid to flash the flesh – if you've seen his movie Bronson you'd know what were talking about – but we didn't expect him to be this full-on naked either. There's not even a little cloth covering his very-open man parts. 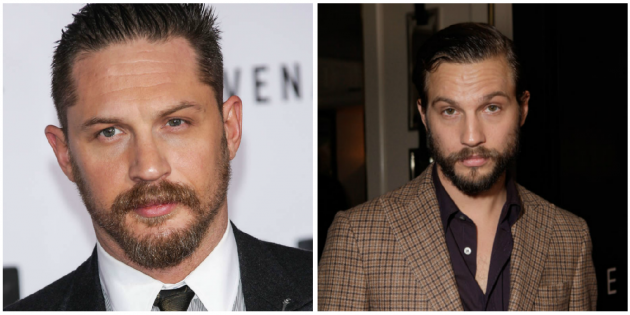 The actor was on set, filming a mini-series, Taboo in Essex last week when the shots were snapped. The 38-year-old also had to do a spot of skinny-dipping for the role, which we're sure wasn't the most pleasant considering the cold weather. He didn't even seem to mind being naked in front of a whole crew either as he was seen laughing and joking despite the chilly temperatures. Fair play, Tom, we don't think we'd have the balls to do it.